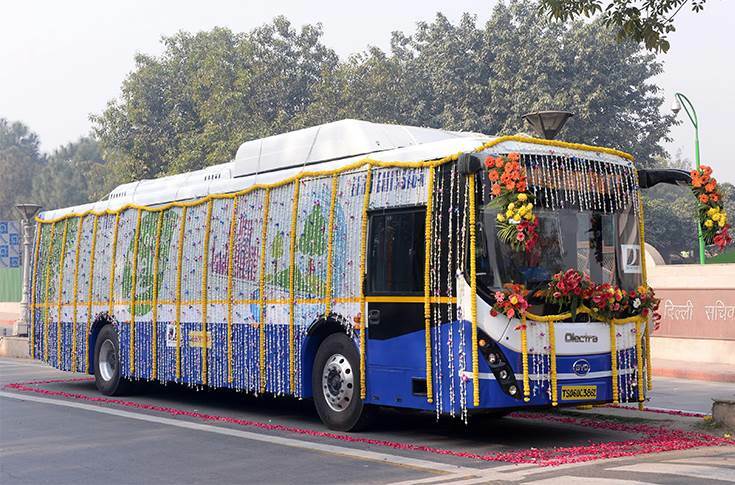 In a move to combat the increasing pollution levels in the capital city of India, the State Government of Delhi today initiated the trials of Olectra-BYD’s 12 Meter electric bus – eBuzz K9 with a 35+1 (Driver) seating capacity. The ‘Made in India’ eBuzz K9 buses from Olectra-BYD was flagged off by Kailash Gahlot, Transport Minister of Delhi from Delhi Secretariat. These trials, which will be conducted for 3 months, will enable the authorities to evaluate the efficiency and competency of the buses in the standard road conditions of Delhi. Under an endeavour to promote usage of zero-emission electric vehicles, Delhi government aims to induct electric buses in the public transport system. According to a study from the World Health Organization, 9 out of every 10 people in the world breathe air that contains high levels of pollutants and kills 7 million people each year. It further highlighted that air pollution is mainly responsible for non-communicable diseases (NCDs), causing 24 percent of all adult deaths from heart disease, 25 percent from stroke, 43 percent from chronic obstructive pulmonary disease and 29 percent from lung cancer. eBuzz K9 model is powered by a lithium-ion iron phosphate battery providing an ability to run up to 300 km on a single recharge. The company claims that high power AC charging enables the battery to recharge in 3-4 hours. The bus comes with ‘Dual in-wheel’ motor solution with integrated regenerated braking recovers 30 percent of lost braking energy. The bus features front & rear air suspension with 'Monocoque Chassis'. It has a kneeling mechanism that provides comfortable boarding to differently-abled and elderly passengers. Olectra-BYD buses are designed and manufactured under a strategic tie-up between Olectra Greentech and BYD Auto Industry – one of the largest electric vehicle company in the world. The Electric Buses from Olectra-BYD is already commercially running in Himachal Pradesh, Mumbai, Telangana and Kerala. Olectra-BYD buses claim to have completed more than 500,000 km on Indian roads and have reduced CO2 emissions up to 524 tonnes till now which would have required 2,619 trees instead.